This current exerts a force which turns the motor. Left hand Rule applies. The moving wires are cutting flux. The direction (-sign) of the current generated in the wire by this induced EMF is in such a direction as to oppose the change (original current) which caused it, according to Lenz’s Law. If this were not the case, we’d get energy for nothing. It’s clear then that the effect of the back-EMF, which generates a current in the motor coils is to reduce the net current in them. An equilibrium is established whereby the current produced by the battery driving the motor is opposed by the current generated by the back-EMF. So, as the motor is turned, it also acts as a generator. 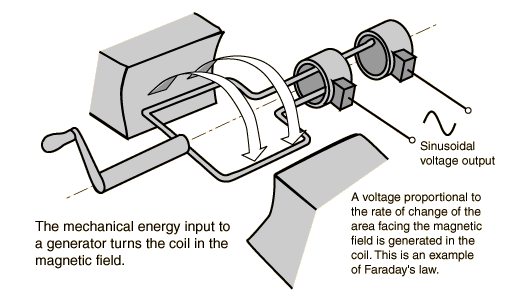 Instead of a hand-cranked device, like the one shown instead imagine a battery is powering the turning coils. The back-EMF generates a current in the turning motor coil and will oppose the change that created it, the battery current. If the motor is not driving a load, then the generated back EMF will almost balance the input voltage and very little current will flow in the coil of the motor. But if the motor is driving a heavy load, doing electrical work, in other words, the back EMF will be less, more current will flow in the motor coil and the electrical power being used is converted to mechanical power in order to drive the load, such as lifting a weight, for example.